they destroyed a great deal of furniture and personal effects at a certain house, carried some of it off and threatened to shoot the citizen if he did not give them $1.000, they were arrested, but as our Colonel and major have frequently expressed their approbation of such method of warfare with the rebels, I fear these villains will escape punishment unless the line officers protest against their release. Wednesday 23 We left our camp this morning and marched toward Vicksburg, about 2 miles, where we camped for the day. We received a large mail from home, which made us feel in good spirits, nothing cheers a soldier so much as the receipt of a good letter from the loved ones at home. We have been without a mail nearly three weeks. Friday 24. 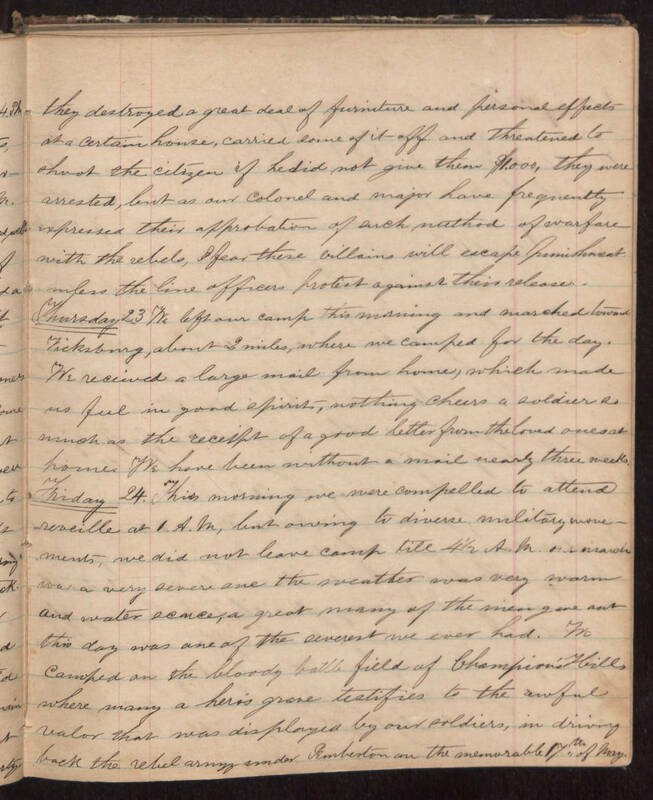 This morning we were compelled to attend reveille at 1 A.M., but owing to diverse military movements, we did not leave camp till 4 1/2 A.M. Our march was a very severe one the weather was very warm and water scarce, a great many of the men gave out this day was one of the severest we ever had. We camped at the bloody battle field of Champion's Hills where many a hero's grave testifies to the awful valor that was displayed by our soldiers, in driving back the rebel army under Pemberton on the memorable 17th of May.